In 1983, Microsoft announced the development of Windows, a graphical user interface (GUI) for its own operating system (MS-DOS). The product line has changed from a GUI product to a modern operating system over two families of design, each with its own codebase and default file system. The 3.x and 4.x family includes Windows 3.0, Windows 3.1x, Windows 95, Windows 98, and Windows ME. Windows for Workgroups 3.11 added 32-bit networking. Windows 95 added additional 32-bit capabilities (however, MS-DOS, some of the kernel, and supplementary utilities such as Disk Defragment remained 16-bit) and implemented a new object oriented user interface, elements of which are still used today. The familiar Windows Explorer desktop shell superseded Program Manager with the release of Windows 95, received major enhancements in 1997, and remained the default shell for all commercial Windows releases until Windows 8's Modern UI-derived Start screen debuted in 2012. The first independent version of Microsoft Windows, version 1.0, released on 20 November 1985, achieved little popularity. It was originally going to be called "Interface Manager" butRowland Hanson, the head of marketing at Microsoft, convinced the company that the name Windows would be more appealing to customers. Windows 1.0 was not a complete operating system, but rather an "operating environment" that extended MS-DOS, and shared the latter's inherent flaws and problems. The first version of Microsoft Windows included a simple graphics painting program called Windows Paint; Windows Write, a simple word processor; an appointment calendar; a card-filer; anotepad; a clock; a control panel; a computer terminal; Clipboard; and RAM driver. It also included the MS-DOS Executive and a game called Reversi. Microsoft had worked with Apple Computer to develop applications for Apple's new Macintosh computer, which featured a graphical user interface. As part of the related business negotiations, Microsoft had licensed certain aspects of the Macintosh user interface from Apple; in later litigation, a district court summarized these aspects as "screen displays". In the development of Windows 1.0, Microsoft intentionally limited its borrowing of certain GUI elements from the Macintosh user interface, to comply with its license. For example, windows were only displayed "tiled" on the screen; that is, they could not overlap or overlie one another. Microsoft Windows version 2 came out on 9 December 1987, and proved slightly more popular than its predecessor. Much of the popularity for Windows 2.0 came by way of its inclusion as a "run-time version" with Microsoft's new graphical applications, Excel and Word for Windows. They could be run from MS-DOS, executing Windows for the duration of their activity, and closing down Windows upon exit. Microsoft Windows received a major boost around this time when Aldus PageMaker appeared in a Windows version, having previously run only on Macintosh. Some computer historians[who?] date this, the first appearance of a significant and non-Microsoft application for Windows, as the start of the success of Windows. Versions 2.0x used the real-mode memory model, which confined it to a maximum of 1 megabyte of memory. In such a configuration, it could run under another multitasker like DESQview, which used the 286 protected mode. Later, two new versions were released: Windows/286 2.1 and Windows/386 2.1. Like prior versions of Windows, Windows/286 2.1 used the real-mode memory model, but was the first version to support the High Memory Area. Windows/386 2.1 had a protected mode kernel with LIM-standard EMS emulation. All Windows and DOS-based applications at the time were real mode, running over the protected mode kernel by using the virtual 8086 mode, which was new with the 80386 processor. Version 2.03, and later 3.0, faced challenges from Apple over its overlapping windows and other features Apple charged mimicked the ostensibly copyrighted "look and feel" of its operating system and "embodie[d] and generated a copy of the Macintosh" in its OS. Judge William Schwarzer dropped all but 10 of Apple's 189 claims of copyright infringement, and ruled that most of the remaining 10 were over uncopyrightable ideas. Microsoft Windows scored a significant success with Windows 3.0, released in May 1990. In addition to improved capabilities given to native applications, Windows also allowed users to better multitask older MS-DOS based software compared to Windows/386, thanks to the introduction of virtual memory. Windows 3.0's user interface finally resembled a serious competitor to the user interface of the Macintosh computer. PCs had improved graphics by this time, due to VGA video cards, and the protected/enhanced mode allowed Windows applications to use more memory in a more painless manner than their DOS counterparts could. Windows 3.0 could run in real, standard, or 386 enhanced modes, and was compatible with any Intel processor from the 8086/8088 up to the 80286 and 80386. This was the first version to run Windows programs in protected mode, although the 386 enhanced mode kernel was an enhanced version of the protected mode kernel in Windows/386. Windows 3.0 received two updates. A few months after introduction, Windows 3.0a was released as a maintenance release, resolving bugs and improving stability. A "multimedia" version, Windows 3.0 with Multimedia Extensions 1.0, was released in October 1991. This was bundled with "multimedia upgrade kits", comprising a CD-ROM drive and a sound card, such as theCreative Labs Sound Blaster Pro. This version was the precursor to the multimedia features available in Windows 3.1 and later, and was part of Microsoft's specification for the Multimedia PC. The features listed above and growing market support from application software developers made Windows 3.0 wildly successful, selling around 10 million copies in the two years before the release of version 3.1. Windows 3.0 became a major source of income for Microsoft, and led the company to revise some of its earlier plans. Support was discontinued on 31 December 2001. During the mid to late 1980s, Microsoft and IBM had cooperatively been developing OS/2 as a successor to DOS. OS/2 would take full advantage of the aforementioned protected mode of the Intel 80286 processor and up to 16 MB of memory. OS/2 1.0, released in 1987, supported swapping and multitasking and allowed running of DOS executables. A GUI, called the Presentation Manager (PM), was not available with OS/2 until version 1.1, released in 1988. Its API was incompatible with Windows. Version 1.2, released in 1989, introduced a new file system, HPFS, to replace the FAT file system. By the early 1990s, conflicts developed in the Microsoft/IBM relationship. They cooperated with each other in developing their PC operating systems, and had access to each other's code. Microsoft wanted to further develop Windows, while IBM desired for future work to be based on OS/2. In an attempt to resolve this tension, IBM and Microsoft agreed that IBM would develop OS/2 2.0, to replace OS/2 1.3 and Windows 3.0, while Microsoft would develop a new operating system, OS/2 3.0, to later succeed OS/2 2.0. This agreement soon however fell apart, and the Microsoft/IBM relationship was terminated. IBM continued to develop OS/2, while Microsoft changed the name of its (as yet unreleased) OS/2 3.0 to Windows NT. Both retained the rights to use OS/2 and Windows technology developed up to the termination of the agreement; Windows NT, however, was to be written anew, mostly independently (see below). After an interim 1.3 version to fix up many remaining problems with the 1.x series, IBM released OS/2 version 2.0 in 1992. This was a major improvement: it featured a new, object-oriented GUI, the Workplace Shell (WPS), that included a desktop and was considered by many to be OS/2's best feature. Microsoft would later imitate much of it in Windows 95. Version 2.0 also provided a full 32-bit API, offered smooth multitasking and could take advantage of the 4 gigabytes of address space provided by the Intel 80386. Still, much of the system had 16-bit code internally which required, among other things, device drivers to be 16-bit code also. This was one of the reasons for the chronic shortage of OS/2 drivers for the latest devices. Version 2.0 could also run DOS and Windows 3.0 programs, since IBM had retained the right to use the DOS and Windows code as a result of the breakup. In response to the impending release of OS/2 2.0, Microsoft developed Windows 3.1, which included several improvements to Windows 3.0, such as display of TrueType scalable fonts (developed jointly with Apple), improved disk performance in 386 Enhanced Mode, multimedia support, and bugfixes. It also removed Real Mode, and only ran on an 80286 or better processor. Later Microsoft also released Windows 3.11, a touch-up to Windows 3.1 which included all of the patches and updates that followed the release of Windows 3.1 in 1992. In 1992 and 1993, Microsoft released Windows for Workgroups (WfW), which was available both as an add-on for existing Windows 3.1 installations and in a version that included the base Windows environment and the networking extensions all in one package. Windows for Workgroups included improved network drivers and protocol stacks, and support for peer-to-peer networking. There were two versions of Windows for Workgroups, WfW 3.1 and WfW 3.11. Unlike prior versions, Windows for Workgroups 3.11 ran in 386 Enhanced Mode only, and needed at least an 80386SX processor. One optional download for WfW was the "Wolverine" TCP/IP protocol stack, which allowed for easy access to the Internet through corporate networks. All these versions continued version 3.0's impressive sales pace. Even though the 3.1x series still lacked most of the important features of OS/2, such as long file names, a desktop, or protection of the system against misbehaving applications, Microsoft quickly took over the OS and GUI markets for the IBM PC. The Windows API became the de facto standard for consumer software. Meanwhile, Microsoft continued to develop Windows NT. The main architect of the system was Dave Cutler, one of the chief architects of VMS at Digital Equipment Corporation (later acquired by Compaq, now part of Hewlett-Packard). Microsoft hired him in August 1988 to create a successor to OS/2, but Cutler created a completely new system instead. Cutler had been developing a follow-on to VMS at DEC called Mica, and when DEC dropped the project he brought the expertise and around 20 engineers with him to Microsoft. DEC also believed he brought Mica's code to Microsoft and sued. Microsoft eventually paid US$150 million and agreed to support DEC's Alpha CPU chip in NT. Windows NT 3.1 (Microsoft marketing wanted Windows NT to appear to be a continuation of Windows 3.1) arrived in Beta form to developers at the July 1992 Professional Developers Conference in San Francisco. Microsoft announced at the conference its intentions to develop a successor to both Windows NT and Windows 3.1's replacement (Windows 95, codenamed Chicago), which would unify the two into one operating system. This successor was codenamed Cairo. In hindsight, Cairo was a much more difficult project than Microsoft had anticipated and, as a result, NT and Chicago would not be unified until Windows XP—albeit Windows 2000, oriented to business, had already unified most of the system’s bolts and gears, it was XP that was sold to home consumers like Windows 95 and came to be viewed as the final unified OS. Parts of Cairo have still not made it into Windows as of 2016 - most notably, the WinFS file system, which was the much touted Object File System of Cairo. Microsoft announced that they have discontinued the separate release of WinFS for Windows XP and Windows Vista and will gradually incorporate the technologies developed for WinFS in other products and technologies, notably Microsoft SQL Server. Driver support was lacking due to the increased programming difficulty in dealing with NT's superior hardware abstraction model. This problem plagued the NT line all the way through Windows 2000. Programmers complained that it was too hard to write drivers for NT, and hardware developers were not going to go through the trouble of developing drivers for a small segment of the market. Additionally, although allowing for good performance and fuller exploitation of system resources, it was also resource-intensive on limited hardware, and thus was only suitable for larger, more expensive machines. However, these same features made Windows NT perfect for the LAN server market (which in 1993 was experiencing a rapid boom, as office networking was becoming common). NT also had advanced network connectivity options and NTFS, an efficient file system. Windows NT version 3.51 was Microsoft's entry into this field, and took away market share from Novell (the dominant player) in the following years. One of Microsoft's biggest advances initially developed for Windows NT was a new 32-bit API, to replace the legacy 16-bit Windows API. This API was called Win32, and from then on Microsoft referred to the older 16-bit API as Win16. The Win32 API had three levels implementations: the complete one for Windows NT, a subset for Chicago (originally called Win32c) missing features primarily of interest to enterprise customers (at the time) such as security and Unicode support, and a more limited subset called Win32s which could be used on Windows 3.1 systems. Thus Microsoft sought to ensure some degree of compatibility between the Chicago design and Windows NT, even though the two systems had radically different internal architectures. Windows NT was the first Windows operating system based on a hybrid kernel. As released, Windows NT 3.x went through three versions (3.1, 3.5, and 3.51); changes were primarily internal and reflected back end changes. The 3.5 release added support for new types of hardware and improved performance and data reliability; the 3.51 release was primarily to update the Win32 APIs to be compatible with software being written for the Win32c APIs in what became Windows 95. After Windows 3.11, Microsoft began to develop a new consumer oriented version of the operating system codenamed Chicago. Chicago was designed to have support for 32-bit preemptive multitasking like OS/2 and Windows NT, although a 16-bit kernel would remain for the sake of backward compatibility. The Win32 API first introduced with Windows NT was adopted as the standard 32-bit programming interface, with Win16 compatibility being preserved through a technique known as "thunking". A new object oriented GUI was not originally planned as part of the release, although elements of the Cairo user interface were borrowed and added as other aspects of the release (notably Plug and Play) slipped. Microsoft did not change all of the Windows code to 32-bit; parts of it remained 16-bit (albeit not directly using real mode) for reasons of compatibility, performance, and development time. Additionally it was necessary to carry over design decisions from earlier versions of Windows for reasons of backwards compatibility, even if these design decisions no longer matched a more modern computing environment. These factors eventually began to impact the operating system's efficiency and stability. Microsoft marketing adopted Windows 95 as the product name for Chicago when it was released on 24 August 1995. Microsoft had a double gain from its release: first, it made it impossible for consumers to run Windows 95 on a cheaper, non-Microsoft DOS; secondly, although traces of DOS were never completely removed from the system and MS DOS 7 would be loaded briefly as a part of the booting process, Windows 95 applications ran solely in 386 enhanced mode, with a flat 32-bit address space and virtual memory. These features make it possible for Win32 applications to address up to 2 gigabytes of virtual RAM (with another 2 GB reserved for the operating system), and in theory prevented them from inadvertently corrupting the memory space of other Win32 applications. In this respect the functionality of Windows 95 moved closer to Windows NT, although Windows 95/98/ME did not support more than 512megabytes of physical RAM without obscure system tweaks. IBM continued to market OS/2, producing later versions in OS/2 3.0 and 4.0 (also called Warp). Responding to complaints about OS/2 2.0's high demands on computer hardware, version 3.0 was significantly optimized both for speed and size. Before Windows 95 was released, OS/2 Warp 3.0 was even shipped preinstalled with several large German hardware vendor chains. However, with the release of Windows 95, OS/2 began to lose market share. It is probably impossible to choose one specific reason why OS/2 failed to gain much market share. While OS/2 continued to run Windows 3.1 applications, it lacked support for anything but the Win32s subset of Win32 API (see above). Unlike with Windows 3.1, IBM did not have access to the source code for Windows 95 and was unwilling to commit the time and resources to emulate the moving target of the Win32 API. IBM later introduced OS/2 into the United States v. Microsoft case, blaming unfair marketing tactics on Microsoft's part. Windows 95 A - included Windows 95 OSR1 slipstreamed into the installation. Windows 95 B - (OSR2) included several major enhancements, Internet Explorer (IE) 3.0 and full FAT32 file system support. Windows 95 B USB - (OSR2.1) included basic USB support. Windows 95 C - (OSR2.5) included all the above features, plus IE 4.0. This was the last 95 version produced. OSR2, OSR2.1, and OSR2.5 were not released to the general public; rather, they were available only to OEMs that would preload the OS onto computers. Some companies sold new hard drives with OSR2 preinstalled (officially justifying this as needed due to the hard drive's capacity). The first Microsoft Plus! add-on pack was sold for Windows 95. Windows NT 4.0 was the successor of 3.51 (1995) and 3.5 (1994). Microsoft released Windows NT 4.0 to manufacturing in July 1996, one year after the release of Windows 95. Major new features included the new Explorer shell from Windows 95, scalability and feature improvements to the core architecture, kernel, USER32, COM and MSRPC. On 25 June 1998, Microsoft released Windows 98 (codenamed Memphis). It included new hardware drivers and the FAT32 file system which supports disk partitions that are larger than 2 GB (first introduced in Windows 95 OSR2). USB support in Windows 98 is marketed as a vast improvement over Windows 95. The release continued the controversial inclusion of theInternet Explorer browser with the operating system that started with Windows 95 OEM Service Release 1. The action eventually led to the filing of the United States v. Microsoft case, dealing with the question of whether Microsoft was introducing unfair practices into the market in an effort to eliminate competition from other companies such as Netscape. In 1999, Microsoft released Windows 98 Second Edition, an interim release. One of the more notable new features was the addition of Internet Connection Sharing, a form of network address translation, allowing several machines on a LAN (Local Area Network) to share a single Internet connection. Hardware support through device drivers was increased and this version shipped with Internet Explorer 5. Many minor problems that existed in the first edition were fixed making it, according to many, the most stable release of the Windows 9x family. Microsoft released Windows 2000 in February 2000. It has the version number Windows NT 5.0. It was successfully deployed both on the server and the workstation markets. Amongst Windows 2000's most significant new features was Active Directory, a near-complete replacement of the NT 4.0 Windows Server domain model, which built on industry-standard technologies like DNS, LDAP, and Kerberos to connect machines to one another. Terminal Services, previously only available as a separate edition of NT 4, was expanded to all server versions. A number of features from Windows 98 were incorporated also, such as an improved Device Manager, Windows Media Player, and a revised DirectX that made it possible for the first time for many modern games to work on the NT kernel. Windows 2000 is also the last NT-kernel Windows operating system to lack product activation. While Windows 2000 upgrades were available for Windows 95 and Windows 98, it was not intended for home users. In September 2000, Microsoft released a successor to Windows 98 called Windows ME, short for "Millennium Edition". It was the last DOS-based operating system from Microsoft. Windows ME introduced a new multimedia-editing application called Windows Movie Maker, came standard with Internet Explorer 5.5 and Windows Media Player 7, and debuted the first version ofSystem Restore – a recovery utility that enables the operating system to revert system files back to a prior date and time. System Restore was a notable feature that would continue to thrive in later versions of Windows, including XP, Vista, and Windows 7. Windows ME was conceived as a quick one-year project that served as a stopgap release between Windows 98 and Windows XP. Many of the new features were available from theWindows Update site as updates for older Windows versions (System Restore and Windows Movie Maker were exceptions). Windows ME was criticized for stability issues, and for lackingreal mode DOS support, to the point of being referred to as the "Mistake Edition" or "Many Errors." Windows ME was the last operating system to be based on the Windows 9x (monolithic) kernel and MS-DOS. On 25 August 2001, Microsoft released Windows XP (codenamed "Whistler"). The merging of the Windows NT/2000 and Windows 95/98/Me lines was finally achieved with Windows XP. Windows XP uses the Windows NT 5.1 kernel, marking the entrance of the Windows NT core to the consumer market, to replace the aging 16/32-bit branch. The initial release met with considerable criticism, particularly in the area of security, leading to the release of three major Service Packs. Windows XP SP1 was released in September 2002, SP2 came out in August 2004 and SP3 came out in April 2008. Service Pack 2 provided significant improvements and encouraged widespread adoption of XP among both home and business users. Windows XP lasted longer as Microsoft's flagship operating system than any other version of Windows, from 25 October 2001 to 30 January 2007 when it was succeeded by Windows Vista. Windows XP Home Edition, for home desktops and laptops - lacked features such as joining Active Directory Domain, Remote Desktop Server and Internet Information Services Server. Windows XP Professional, for business and power users contained all features in Home Edition. Windows XP Media Center Edition (MCE), released in October 2002 for desktops and notebooks with an emphasis on home entertainment. Contained all features offered in Windows XP Professional and the Windows Media Center. Subsequent versions are the same but have an updated Windows Media Center. Windows XP Media Center Edition 2005, released on 12 October 2004. Included Windows XP Service Pack 2, the Royale Windows Theme and joining a Windows Active Directory Domain is disabled. The Aquarium, Da Vinci, Nature and Space themes are retained from Windows XP Plus! Windows XP Professional x64 Edition, released on 25 April 2005 for home and workstation systems utilizing 64-bit processors based on the x86-64 instruction set originally developed by AMD as AMD64; Intel calls their version Intel 64. Internally, XP x64 was a somewhat updated OS based on the Server 2003 code line. Windows XP 64-bit Edition, is a version for Intel's Itanium line of processors; maintains 32-bit compatibility solely through a software emulator. It is roughly analogous to Windows XP Professional in features. It was discontinued in September 2005 when the last vendor of Itanium workstations stopped shipping Itanium systems marketed as "Workstations". On 25 April 2003 Microsoft launched Windows Server 2003, a notable update to Windows 2000 Server encompassing many new security features, a new "Manage Your Server" wizard that simplifies configuring a machine for specific roles, and improved performance. It has the version number NT 5.2. A few services not essential for server environments are disabled by default for stability reasons, most noticeable are the "Windows Audio" and "Themes" services; users have to enable them manually to get sound or the "Luna" look as per Windows XP. The hardware acceleration for display is also turned off by default, users have to turn the acceleration level up themselves if they trust the display card driver. December 2005, Microsoft released Windows Server 2003 R2, which is actually Windows Server 2003 with SP1 (Service Pack 1) plus an add-on package. Among the new features are a number of management features for branch offices, file serving, printing and company-wide identity integration. On 25 April 2005, Microsoft released Windows XP Professional x64 Edition and Windows Server 2003, x64 Editions in Standard, Enterprise and Datacenter SKUs. Windows XP Professional x64 Edition is an edition of Windows XP for x86-64 personal computers. It is designed to use the expanded 64-bit memory address space provided by the x86-64 architecture. Windows XP Professional x64 Edition is based on the Windows Server 2003 codebase; with the server features removed and client features added. Both Windows Server 2003 x64 and Windows XP Professional x64 Edition use identical kernels. Windows XP Professional x64 Edition is not to be confused with Windows XP 64-bit Edition, as the latter was designed for Intel Itanium processors. During the initial development phases, Windows XP Professional x64 Edition was named Windows XP 64-Bit Edition for 64-Bit Extended Systems. Windows Server 2003 R2, an update of Windows Server 2003, was released to manufacturing on 6 December 2005. It is distributed on two CDs, with one CD being the Windows Server 2003 SP1 CD. The other CD adds many optionally installable features for Windows Server 2003. The R2 update was released for all x86 and x64 versions. Windows Server 2003 R2 Enterprise Edition was not released for Itanium. In July 2006, Microsoft released a thin-client version of Windows XP Service Pack 2, called Windows Fundamentals for Legacy PCs (WinFLP). It is only available to Software Assurancecustomers. The aim of WinFLP is to give companies a viable upgrade option for older PCs that are running Windows 95, 98, and Me that will be supported with patches and updates for the next several years. Most user applications will typically be run on a remote machine using Terminal Services or Citrix. Windows Home Server (codenamed Q, Quattro) is a server product based on Windows Server 2003, designed for consumer use. The system was announced on 7 January 2007 by Bill Gates. Windows Home Server can be configured and monitored using a console program that can be installed on a client PC. Such features as Media Sharing, local and remote drive backup and file duplication are all listed as features. Windows Vista was released on 8 November 2006 to business customers, consumer versions following on 30 January 2007. Windows Vista intended to have enhanced security by introducing a new restricted user mode called User Account Control, replacing the "administrator-by-default" philosophy of Windows XP. Vista was the target of much criticism and negative press, and in general was not well regarded; this was seen as leading to the relatively swift release of Windows 7. One major difference between Vista and earlier versions of Windows, Windows 95 and later, is that the original start button was replaced with just the Windows icon. 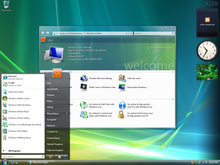 Vista also features new graphics features, the Windows Aero GUI, new applications (such as Windows Calendar, Windows DVD Maker and some new games including Chess, Mahjong, and Purble Place), Internet Explorer 7, Windows Media Player 11, and a large number of underlying architectural changes. Windows Vista has the version number NT 6.0. All editions (except Starter edition) are currently available in both 32-bit and 64-bit versions. The biggest advantage of the 64-bit version is breaking the 4 gigabyte memory barrier, which 32-bit computers cannot fully access. Windows Server 2008, released on 27 February 2008, was originally known as Windows Server Codename "Longhorn". Windows Server 2008 builds on the technological and security advances first introduced with Windows Vista, and is significantly more modular than its predecessor, Windows Server 2003. Windows 7 was released to manufacturing on 22 July 2009, and reached general retail availability on 22 October 2009. It was previously known by the codenames Blackcomb and Vienna. Windows 7 has the version number NT 6.1. Some features of Windows 7 are faster booting, Device Stage, Windows PowerShell, less obtrusive User Account Control, multi-touch, and improved window management. Features included with Windows Vista and not in Windows 7 include the sidebar (although gadgets remain) and several programs that were removed in favor of downloading their Windows Live counterparts. In some countries (Austria, Belgium, Bulgaria, Croatia, Cyprus, Czech Republic, Denmark, Estonia, Finland, France, Germany, United Kingdom, Greece, Hungary, Iceland, Ireland, Italy, Latvia, Liechtenstein, Lithuania, Luxembourg, Malta, Netherlands, Norway, Poland, Portugal, Romania, Slovakia, Slovenia, Spain, Sweden, and Switzerland), there are other editions that lack some features such as Windows Media Player, Windows Media Center and Internet Explorer called names such as "Windows 7 N." Microsoft focuses on selling Windows 7 Home Premium and Professional. All editions, except the Starter edition, are available in both 32-bit and 64-bit versions. Unlike the corresponding Vista editions, the Professional and Enterprise editions are supersets of the Home Premium edition. At the Professional Developers Conference (PDC) 2008, Microsoft also announced Windows Server 2008 R2, as the server variant of Windows 7. Windows Server 2008 R2 ships in 64-bit versions (x64 and Itanium) only. Windows Home Server 2011 code named 'Vail' was released on 6 April 2011. Windows Home Server 2011 is built on the Windows Server 2008 R2 code base. It follows the release of Windows Home Server Power Pack 3 which added support for Windows 7 to Windows Home Server. Windows Home Server 2011 is considered a "major release". (Its predecessor having been built on Windows Server 2003) and only supports x86-64 hardware. In 2011, Microsoft introduced Windows Thin PC or WinTPC, which is a feature- and size-reduced locked-down version of Windows 7 expressly designed to turn older PCs into thin clients. WinTPC is available for software assurance customers and relies on cloud computing in a business network. Wireless operation is supported since WinTPC has full wireless stack integration, but wireless operation may not be as good as the operation on a wired connection. Windows 8 is the current version of Microsoft Windows. One edition, Windows RT, runs on some system-on-a-chip devices with mobile 32-bit ARM (ARMv7) processors. Windows 8 features a redesigned user interface, designed to make it easier for touchscreen users to use Windows. The interface introduced an updated Start menu known as the Start screen, and a new full-screen application platform. The desktop interface is also present for running windowed applications, although Windows RT will not run any desktop applications not included in the system. On the Building Windows 8 blog, it was announced that a computer running Windows 8 can boot up much faster than Windows 7. New features also include USB 3.0 support, the Windows Store, the ability to run from USB drives with Windows To Go, and others. The first public preview of Windows Server 2012 was also shown by Microsoft at the 2011 Microsoft Worldwide Partner Conference. Windows 8 Release Preview and Windows Server 2012 Release Candidate were both released on 31 May 2012. Product development on Windows 8 was completed on 1 August 2012, and it was released to manufacturing the same day. Windows Server 2012 went on sale to the public on 4 September 2012. Windows 8 went on sale 26 October 2012. Windows 8.1 and Windows Server 2012 R2 were released on 17 October 2013. Windows 8.1 is available as an update in the Windows store only for Windows 8 users and also available to download for clean installation. The update adds new options for resizing the live tiles on the Start screen. Windows 10 is an upcoming release of the Microsoft Windows operating system. Unveiled on September 30, 2014, it will be released on July 29, 2015. It will be distributed with no charge to Windows 7 and 8 users for the first year. Windows Server 2016 (it may not be the final name) is an upcoming release of the Microsoft Windows Server operating system. Unveiled on September 30, 2014, it is planned to be released in 2016.